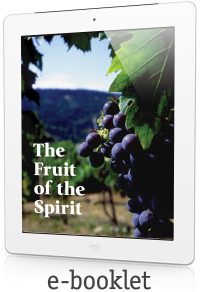 Jesus Christ taught important spiritual lessons regarding the "fruit" of our lives. What are those lessons, and how well are we applying them? Our eternal life depends on this understanding! Jesus Christ taught important spiritual lessons regarding the "fruit" of our lives. What are those lessons, and how well are we applying them? Our eternal life depends on this understanding! Jesus Christ is cultivating supernatural "fruit" in the lives of His disciples. To understand that miraculous effect, we must first understand the awesome cause and ultimate source—the Spirit of God. When God's Spirit is at work in a person, amazing things happen. The person's whole life blossoms and bears beautiful fruit. And the most wonderful fruit of all is the giving and receiving of true love. Jesus said to His disciples, "These things I have spoken to you, that My joy may remain in you, and that your joy may be full" (John 15:11). That sounds almost too good to be true! How can we experience this fullness of joy? The apostle Paul, locked in a depressing prison cell, wrote, "I have learned in whatever state I am, to be content." He reminded his readers that they also could have "God's peace, which is far beyond human understanding." You too can have this unique contentment and peace! The popular impatiens flowers are so named from seeming to be highly impatient! When their seed pods mature, they explode when touched, sending seeds several yards away. See how this picture illustrates the need for longsuffering, an important fruit of God's Spirit! God's nature is that of incredible loving-kindness toward all people. And He will kindly help His followers cultivate the much-needed fruit of godly kindness. The spiritual fruit of goodness enables sinful man to do good and to be good—good in the truest sense of the word. Goodness, after all, is the essence of God's nature. Do you trust God completely? So much so that you live accordingly—to the point that He is able to trust you? When Jesus Christ returns, wouldn't it be wonderful to hear Him say approvingly, "Well done, good and faithful servant"? In this series of articles on the fruit of the Spirit, we have come to the last of the nine virtues—self-control. Of all the things we have to govern in this life, self is often our greatest challenge! Victory requires understanding the enemy. In our spiritual warfare, the enemy is us! Raw human nature is like a field taken over by noxious weeds. We must eradicate the weeds and replace them with God's Spirit so we can produce much good fruit! We can become like God by having His Spirit dwelling in us. As we grow spiritually, we should see more and more evidence of that miracle—more and more "fruit of the Spirit." And with more and more fruit, there is more and more to give to others! It's vital that Christians bear fruit in their lives—the fruit of the Spirit. But what does that fruit look like? In Jesus Christ we have the perfect example of what God's Spirit should produce in our lives. In Jesus' parable of the sower, recorded in Matthew 13, Mark 4 and Luke 8, "the seed is the word of God" (Luke 8:11). In the beginning, God created mankind "in His own image" with wonderful bodies and minds; He also created everything else on earth for man's benefit (Genesis 1:26-30).